NG4 Pompeii. Porta Nola Tombs. Tomb of Sextus Caesernius Montanus, son of Spurius. Tomb NG4 Pompeii. 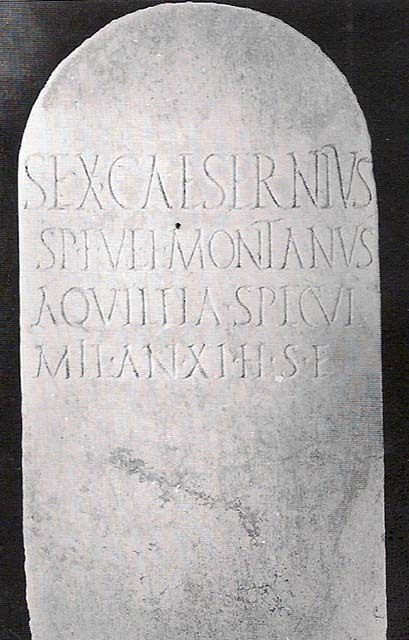 Tomb of Sextus Caesernius Montanus, son of Spurius. Marble stele, with rounded top. Sextus Caesernius Montanus, son of Spurius, of the Velinan tribe, from Aquileia, bodyguard, performed military service for 11 years, is buried here. See Cooley, A. and M.G.L., 2004. Pompeii : A Sourcebook. London : Routledge. G68, p.156.